Home - Hi-Tech Marketing Writing - DGPR inc.
DGPR provides you copywriting services to help you get the word out. Trumpet your message loud and clear. Customers will read about your products or services in print and online. Plus, you generate quality sales leads through website content. DGPR and our associate web marketing firm, E-Nor, combine our talents to do all this! Click here to read O’Dwyer’s PR article on how that’s done. You can create major market visibility for your products or services. But to achieve it, you must maintain high communications frequency – meaning you’ve got to keep getting your messages to the market all the time. With vast tech press experience, DGPR can methodically deliver your messages to your markets. With 15+ years high-tech PR experience, we know what editors need and want and how to package your product or service value proposition so it is editorially acceptable. "Dan Garza has provided successfully implemented marketing support for my company, NexLogic, for the past three years. He and I have worked closely to develop and write a sustained program of strategic articles published in the publications my customers read. Several existing and new customers have reported reading my articles; they pass copies of my articles to their associates; and based on the credibility these articles convey, they come to us for their solutions. I highly recommend Dan and his approach for building greater market awareness. It certainly is working for us. " 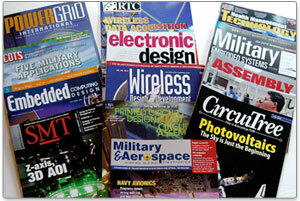 DGPR has written for a number of popular technical publications. See our full list of publications. Article in O’Dwyer’s PR Report guides you through turbo-charged marketing PR. San Jose Business Journal - "Deliver a sustained communications barrage to your markets"
San Jose Business Journal article says conventional PR is out; proactive marketing PR is in as the correct strategy to gain industry recognition. Industry Insights - "Marketing and Public Relations Working Hand in Hand". Industry Insights article details how a marketing plan can exploit the right PR tools at the right time for maximum customer communications impact. .
U. S. Tech - "Marketing: Are you Doing It?" U. S. Tech article provides a comprehensive list of marketing and sales benefits thanks to a carefully crafted and executed market communications program.. .
With 15+ years experience in high-tech marketing PR and writing, Dan Garza has a proven track record for successfully building market awareness for client products and services.